USDA Agricultural Trade Office in Sao Paulo (ATO) of projects Brazilian marketing year (MY) 2018/2019 (July-June) coffee production at a record 60.2 million bags (60 kilograms per bag), green equivalent, an increase of 18 percent relative to the previous season. MY 2018/19 Arabica production is forecast at 44.5 million bags, an increase of 6 million bags vis-a-vis the previous crop, given that the majority of producing areas are in the on-year of the biennial production cycle. Note that coffee production both in Parana and south-eastern Minas Gerais are on the off-year of the biennial production cycle, however, the drop in production is expected to be less intense than average. Good weather conditions in the majority of the producing regions contributed to steady fruit setting, coffee bean development and filling, and will likely result in high yields. The bulk of the Arabica coffee harvest should start in May/June. Robusta/Conillon production for MY 2018/19 is forecast at 15.7 million bags, an increase of 27 percent compared to MY 2017/18 (12.4 million bags). 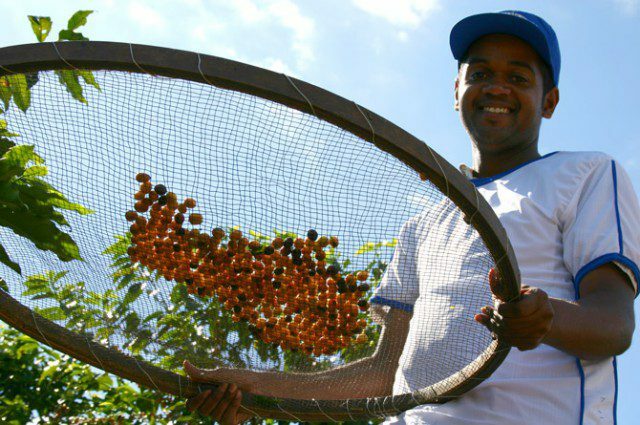 Good weather conditions, especially abundant rainfall, are the drivers for expected higher production in the three major producing states of Espirito Santo, Rondonia, and Bahia. The expansion of clonal seedlings and improved crop management techniques have also support the likely increase in Rondonia. Harvest in the Robusta/Conillon producing regions started in April/May. Post conducted field trips to the major coffee producing areas (Minas Gerais, Espirito Santo, Sao Paulo, Rondonia and Parana) to observe vegetative development, cherry set, and fruit formation to assess the 2018 crop. Information was also collected from government sources, state secretariats of agriculture, grower associations, cooperatives, and traders. The table below shows coffee forecast production by state and variety for MY 2018/19 as well as production estimates from MY 2014/15 to MY 2017/18. The table below shows the Brazilian coffee area and tree population from MY 2014/15 through MY 2018/19. Total area planted to coffee is projected stable at 2.395 million hectares, whereas coffee tree inventory decreased by one percent relative to MY 2016/17. The Brazilian coffee yield for MY 2018/19 is projected at a record 29.22 bags/hectare, an increase of sixteen percent relative to the previous crop (25.20 bags/hectare). This is mainly due to favorable weather conditions in the majority of the crop areas and the on-year of the biennial production cycle for Arabica trees (expect in Parana and south-eastern Minas Gerais). Arabica coffee prices dropped by 11 percent in the first four months of 2018 compared to the same period of 2017, a signal that the market has anticipated a larger crop for the upcoming season. Robusta coffee prices fell even more, recording a 29 percent drop using the same reference periods, given the expected drastic recovery in Robusta production. Therefore, the price differential between both varieties has broadened to pre-shortage in supply levels in 2015/16. ATO/Sao Paulo projects Brazil’s domestic coffee consumption for MY 2018/19 at 23 million coffee bags (21.82 million bags of roast/ground and 1.18 million bags of soluble coffee, respectively), a three percent increase relative to MY 2017/18. Coffee enjoys a high penetration in Brazilian households and there are strong indicators that the Brazilian economy is recovering. Signals such as low inflation rates and a 2.5 and 3.0 percent forecast growth in the Brazilian Gross Domestic Product (GDP) for 2018 and 2019, highlight recovery. The Brazilian Coffee Industry Association (ABIC) reports that the coffee industry processed 22 million bags, green equivalent, from November 2016 to October 2017, an increase of four percent compared to the same period the year before (21.2 million bags). Per capita consumption for 2017 is estimated slightly up from 2016, at 5.10 kg of roasted coffee per person. 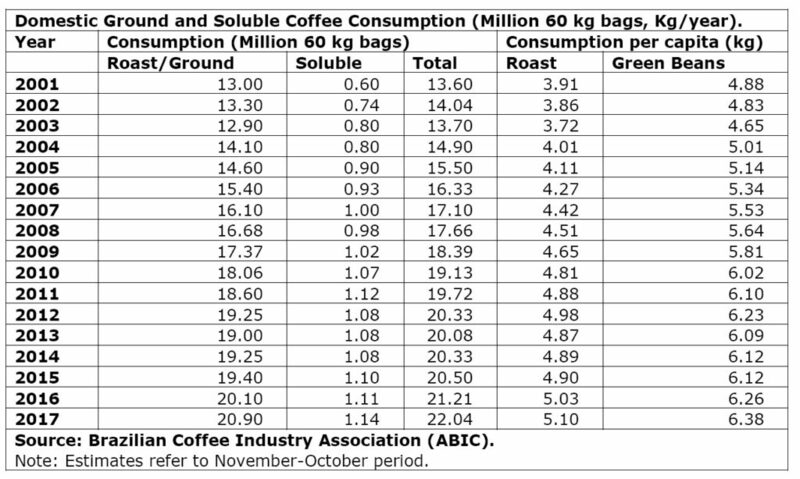 The table below shows domestic ground and soluble coffee consumption as reported by ABIC. Total Brazilian coffee exports for MY 2018/19 are forecast up at 35.33 60-kg million bags, due to expected larger coffee supply. Green bean exports are forecast to account for 32 million bags, while soluble coffee exports are projected at 3.3 million bags. ATO/Sao Paulo estimates coffee exports for MY 2017/18 at 30.42 million 60-kg bags, green beans, a decrease of eight percent from MY 2016/17 (33.08 million bags), based on year-to-date export volumes and anticipated May-June loadings. Green bean (Arabica and Robusta/Conillon) exports are estimated at 27.2 million bags, whereas soluble coffee exports are estimated at 3.2 million bags. 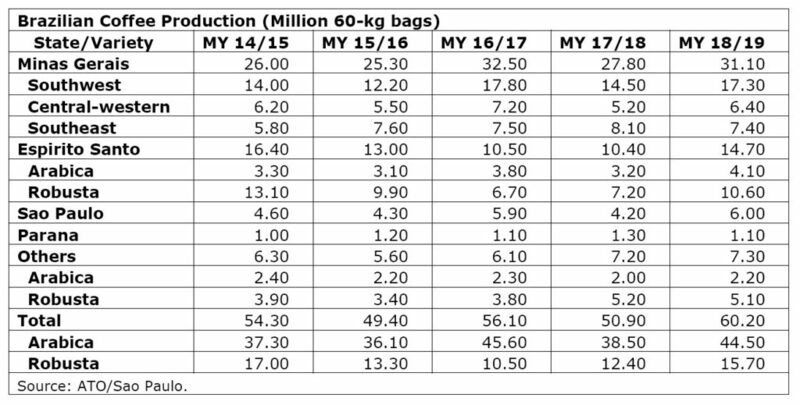 According to the April 2018 coffee trade statistics released by the International Coffee Organization (ICO), total world coffee consumption for 2017/18 is estimated at 159.92 million bags, up 2.06 million bags relative to 2016/17. Brazil represents roughly one third of total world exports. 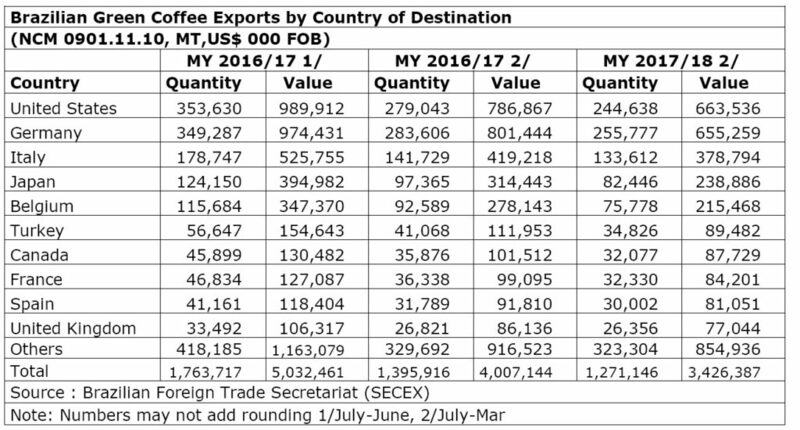 The table below shows green coffee bean (NCM 0901.11.10), exports by country of destination, according to SECEX, for MY 2016/17 (July-June) and MY 2016/17 and 2017/18 (July-March). ATO/Sao Paulo forecasts total ending stocks in MY 2018/19 at 4 million bags, an increase of 1.93 million bags vis-a-vis the previous MY (2.07 million bags), due to expected recovery in coffee supply. Government stocks are virtually zero. CONAB’s 2018 privately-owned stocks survey has not yet been released. The survey includes coffee stocks held by growers, coffee cooperatives, exporters, roasters, and the soluble industry as of March 31, 2018.